"The world has changed. People don't have landlines anymore. 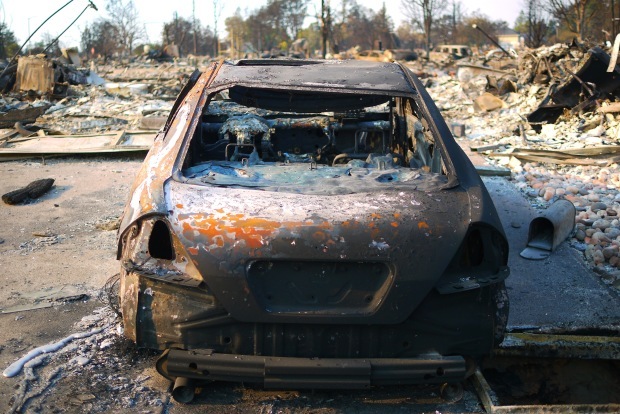 The other thing to keep in mind, the fire was unbelievably fast"
California Highway Patrol officers go door-to-door to ask residents to voluntarily evacuate as a wildfire approaches on October 11, 2017 in Sonoma. Communities in wildfire-prone Northern California have an array of emergency systems designed to alert residents of danger: text messages, phone calls, emails and tweets. But after days of raging blazes left at least 23 dead, authorities said those methods will be assessed after some residents complained those warnings never got through. The fast-moving fires, strengthened by fierce winds and nearly absent humidity, began to burn through the state's fabled wine country Sunday night. Counties used a variety of ways to send out warnings, but the alert systems rely on mobile phones, landlines or the internet to rouse residents. 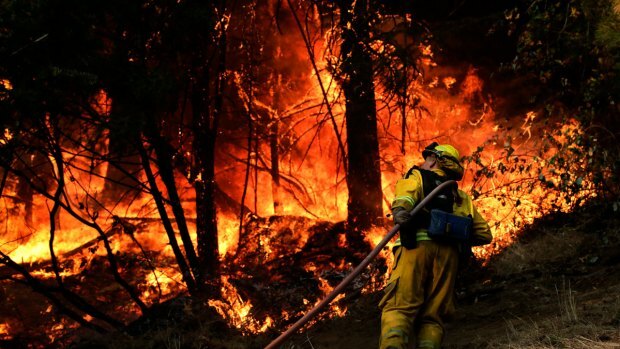 "People were in bed, asleep at midnight, and these fires came down on these communities with no warning within minutes," said state fire agency Chief Ken Pimlott. "There was little time to notify anybody by any means," he added. 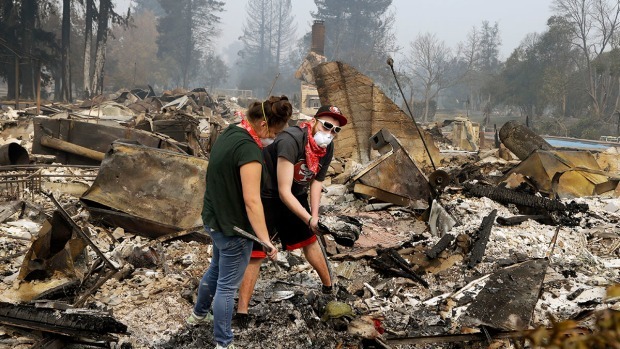 Sonoma County used various systems in an attempt to alert residents of the approaching flames but also decided against using what's known as a Wireless Emergency Alert, a widespread message sent to cell phones in the region, sometimes compared to an Amber Alert issued for missing children. Because of its broad reach, officials concluded the message could panic people not in danger, triggering unnecessary evacuations that would snarl traffic and delay emergency vehicles, said county spokeswoman Jennifer Larocque. "They would have reached many people not affected by the fire," she said. "It would have delayed our response." In emergencies where a few minutes or even seconds can save lives, the notification systems have inherent blind spots. Not everyone will get the message. Sonoma County uses a service that sends out text messages or emails when an evacuation is ordered, but residents have to sign up to receive them. The county also uses a mobile phone app that can receive messages, but again it requires a resident to opt-in to participate. The county can also trigger automated emergency calls to landlines in an area threatened by fire, but that would only reach homes with those phones. Sonoma County sheriff Rob Giordano urged residents at a press conference Wednesday to sign up for one of the text message alert systems, called SoCoAlert. Residents can also recieve emergency alerts via text message by signing up for Nixle, a private service that sends alerts to users based on zip code. Nixle will send emergency alerts over text, voice call and email, the Mercury News reported. On Sunday night, the Sonoma County Sheriff’s Office sent its first alert via Nixle, to warn residents of several fires. About 10 minutes later, law enforcement sent out the first mandatory evacuation orders. However, nearly 80 cellphone towers were knocked out or badly damaged, officials said. Some evacuees escaped only when they realized the fire was nearly at their doors. 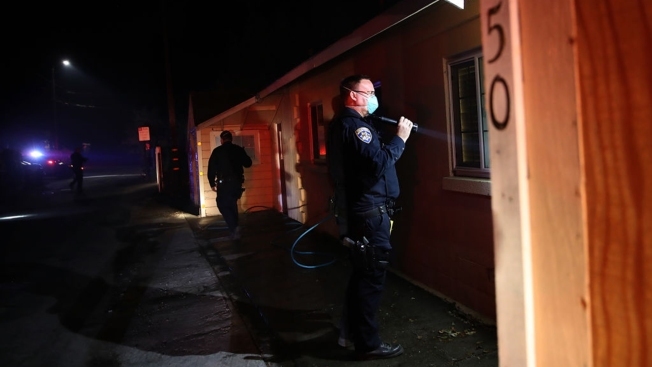 David Leal was at his home in Santa Rosa about 11:30 p.m. Sunday when strong winds began stirring and he smelled smoke. Growing increasingly anxious, he called a fire dispatcher but was assured that there was no need to worry unless he saw flames. He looked outside and didn't, so he and his wife went to bed. At 2 a.m., they were jarred awake when a sudden blast of wind knocked a lamp off a nightstand. Leal looked out at neighbors who were packing up to get out. There was never a phone call, or a knock on the door. "We didn't know what was going on, but just instinct led us to agree on the decision to evacuate," he said. State Sen. Bill Dodd of Napa said he received an alert Sunday night to evacuate, but by that time he had already decided to get out. His power had kicked off at 10 p.m. He looked up a hillside by his home and "it was the most incredible fire coming at us," Dodd said. "A lot of it is common sense." Sonoma County Sheriff Sgt. Spencer Crum was on duty Sunday night when he smelled smoke in the parking lot of the department's headquarters in Santa Rosa. Ducking inside, dispatch calls started coming in about fire in the nearby hills. He and about a dozen other deputies raced to two rural neighborhoods with sirens blaring and warning residents on their loudspeakers of the fast-approaching blaze. Deputies went door-to-door urging residents to flee. "Unfortunately, some of them were disbelieving and wanted to argue," Crum said. When the fire got too close, they raced down the hill to warn others to flee. "They didn't need any convincing," Crum added. "By that time, you could see the flames approaching." Sonoma County also posts evacuation notices on a website, Facebook, and Twitter. "Various counties use different ways to push information out to the public. And to my knowledge they were used by the counties where they could be used," said Mark Ghilarducci, director of the Governor's Office of Emergency Services. "I think it's still too premature to determine what actually worked and what didn't," Ghilarducci said. 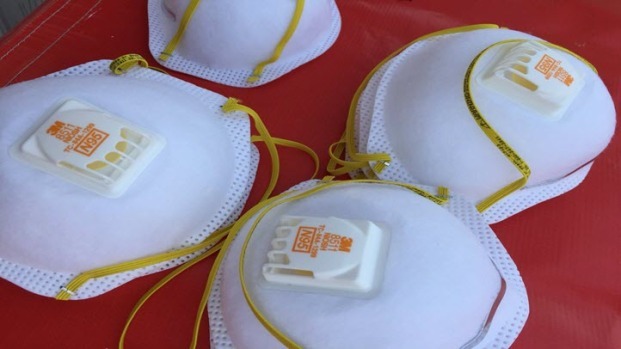 Our NBC Bay Area Responds team is providing free breathing masks and recharge stations to North Bay wildfire evacuees. Sonoma County Sheriff Robert Giordano said his office did the best it could to notify people of evacuations after the blaze broke out Sunday, but he acknowledged the limitations in the systems. "The world has changed. People don't have landlines anymore," Giordano said. "The other thing to keep in mind, the fire was unbelievably fast." Blood reported from Los Angeles. Associated Press writers Paul Elias in Santa Rosa, Don Thompson in Sacramento and Olga Rodriguez in San Francisco contributed.